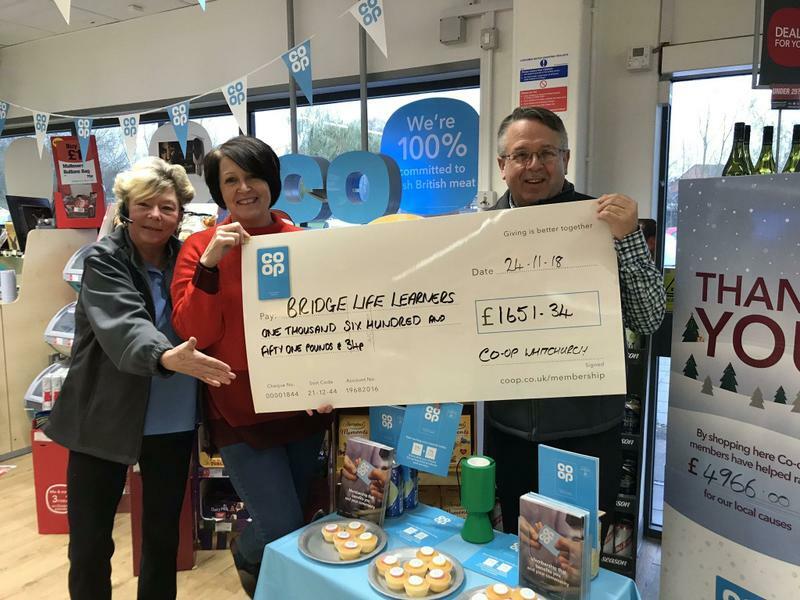 Bridge Learning Campus recently secured £1,651.34 from the Co-op in Whitchurch for a Bridge Life Learners project. The funding application was completed by Mrs Selby and will be used for to support extra cookery classes and purchase some new equipment. Mrs Selby said "We are trying to promote healthy eating to families by sharing recipes and top tips. With this funding we will be able to buy much needed resources. Through coming to our club our students learn life long skills such as shopping on a budget, the importance of shopping for seasonal products and cooking to name but a few. The most important thing that our club does for our students is to provide a safe environment to try new things, to build their confidence and self esteem and prepare them for society". The photo below shows Mrs Selby being presented the giant cheque from Co-op staff.